In today’s fast paced self-service world, the use of kiosks has become increasingly popular. it mainly location in beach or pedestrian street. service many different snack food and drinks . such as ice cream , frozen yogurt , juice , bubble tea , coffee , cake and more . 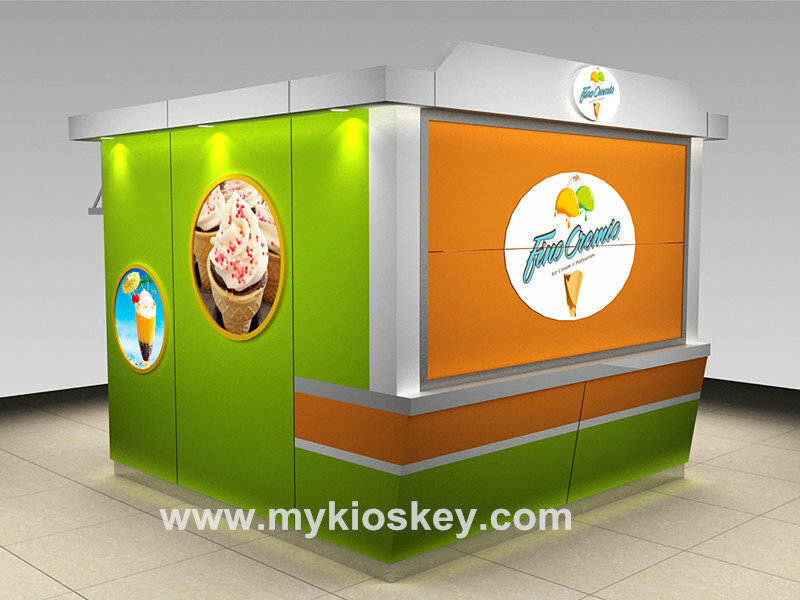 In this article I will introduce two very popular outdoor food kiosks for your reference. If you are interested in starting a food business, take a few minutes and go through it with me at below ! 1. Why outdoor kiosk is so popular ? Advantage 1. Extensive location selection：Outdoor food kiosks are often placed throughout campuses (both university and corporate), national parks, outdoor shopping plazas and malls, amusement parks . Advantage 2 . Structural durabilities：outdoor kiosks are sunlight readable, rust-free and incredibly durable for the weather they can, and often do endure. Advantage 3 : Low cost, portable, can move overall,convenient to use . 2. Share two successful cases . 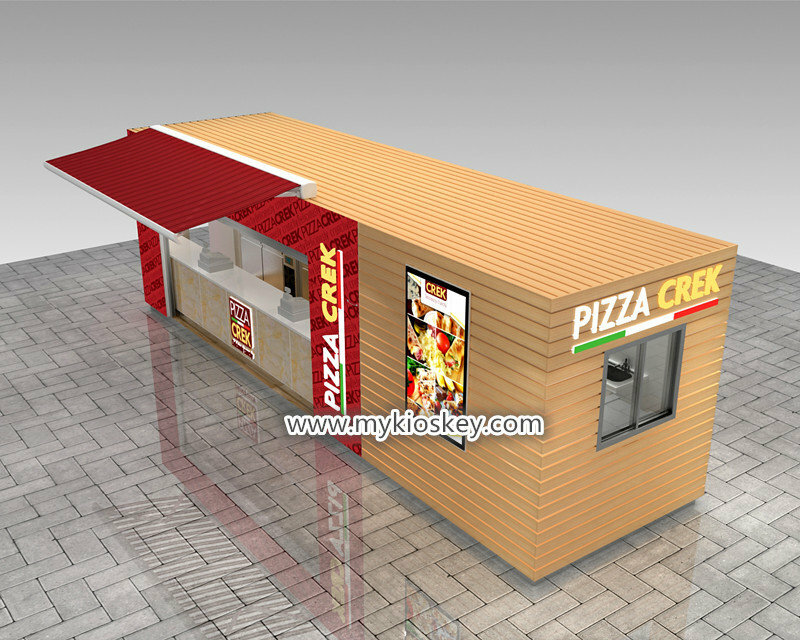 Whole pizza shop is 8m length by 2.2m width , basic material is plywood, surface is laminate and solid wood strip decoration . is very modern and high end . the front part with a big window for customer order and package . There’s a big canopy , It can block the sun and rain . 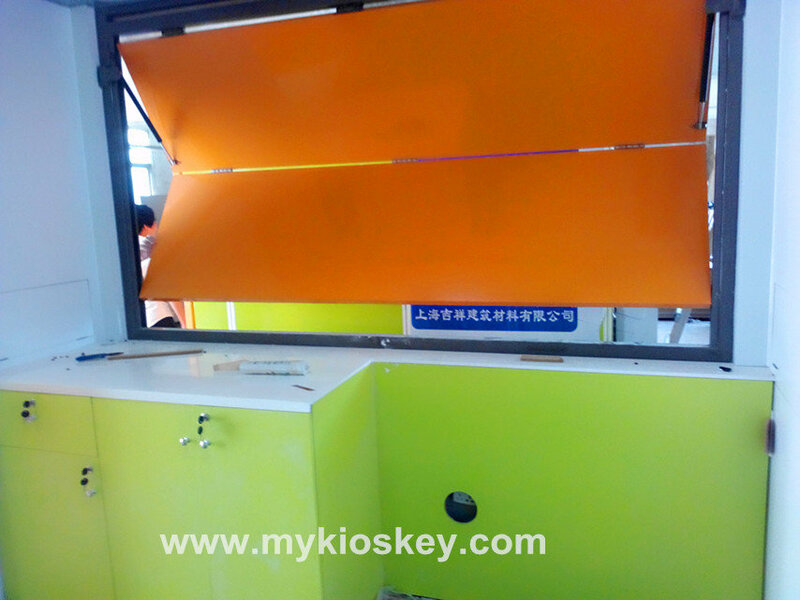 if you want put this kiosk to outdoor , it will be a good choice make it like this . See this shop inside layout is very simple , but very comfortable , whole shop have two area , one is making area , anothere is sale area. left is sale area with two sides wooden counter , the below with many undercounter refrigerator , can storage many raw material , the right part mainly for pizza making , with oven and sink . 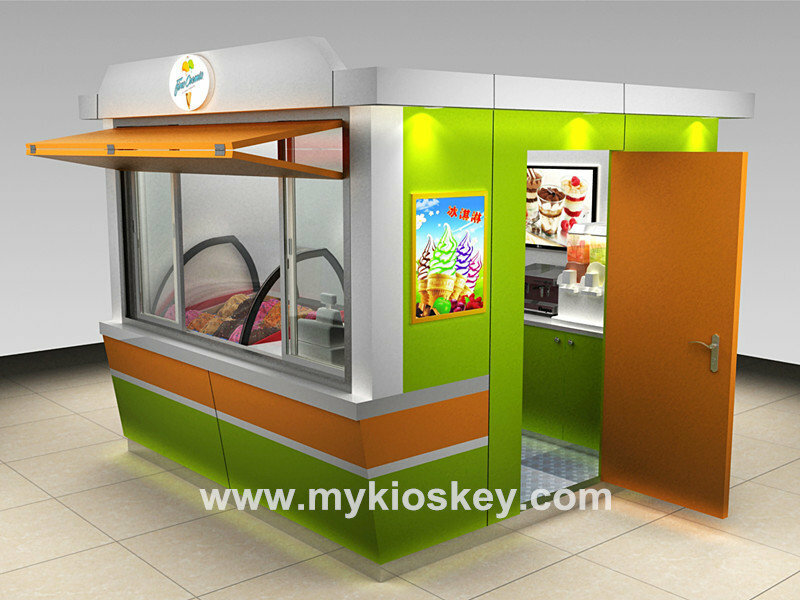 When you first saw this outdoor food kiosk , I believe that you will be deeply attracted by its appearance, it is very eye-catching and high end , it can for selling ice cream , juice , coffee and more . 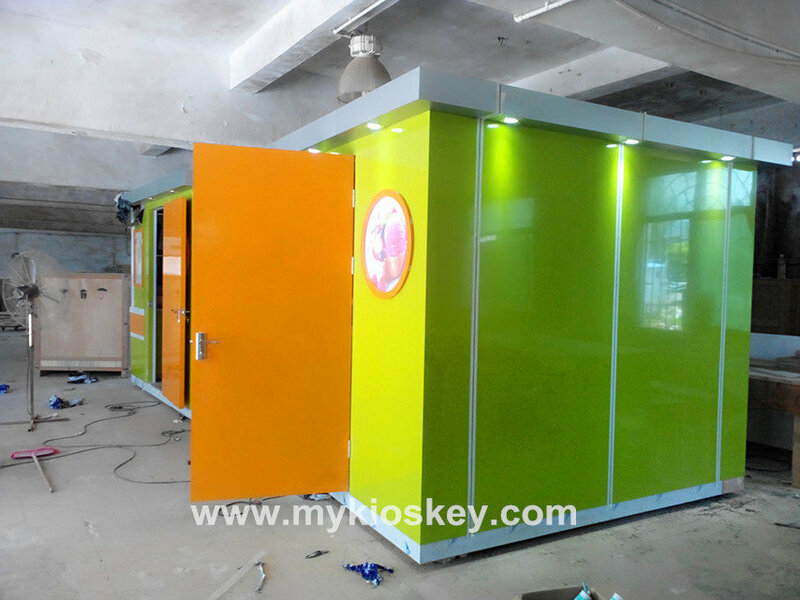 Material : Whole shop inside with metal frame .Flame retardant plywood as basic material , surface is aluminium-plastic panel ，with round light box imags showcase . fresh green color match orange a little white . the front part is a big showcase window . top part with a big luminescence LOGO . You will notice the whole kiosk four sides with spotlight , customer can saw it from each angle ．the bottom of this kiosk with white led light strip. is very bright . 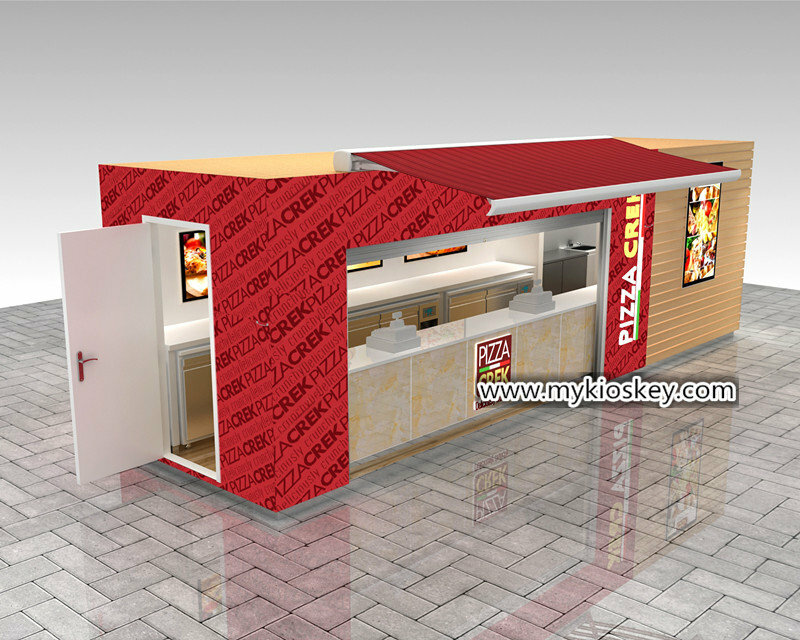 Layout : whole kiosk is a square shape , total size is 3ｍ length by 3m width , 2.4m height . I have to say this is a great use of space for sales and presentation. front part mainly for selling , the right sides with a door can go through the kiosk , the back sides is a row wooden counter . can put juice machine , coffee machine , milkshake machine etc . The below is some real production photo for your views . 3.How can i choose a high quality outdoor food kiosk like this one ? If you want whole shop enough strong．choose right and high quality material is very important . Like the green color food kiosk . We will use the metal tube to weld the most basic frame , they choose fire retardant plywood as basic material . surface use aluminium-plastic panel. of course , If you prefer the surface of the wood grain ， solid wood and eco-Wood also is a good choose . Before building the whole kiosk , check the surrounding environment, tone and local climate，So that kiosk can be fully integrated, will not be obtrusive . If there is a lot of rain and snow in the area, consider making a ridge at the top , Can quickly drain the rain water. Effectively extend the service life of the entire kiosk. Thanks for your time and reading , hope this article is helpful to your business development ，if you interested build a outdoor food kiosk like this one , if you have ideas , Please do not hesitate to contact us immediately .